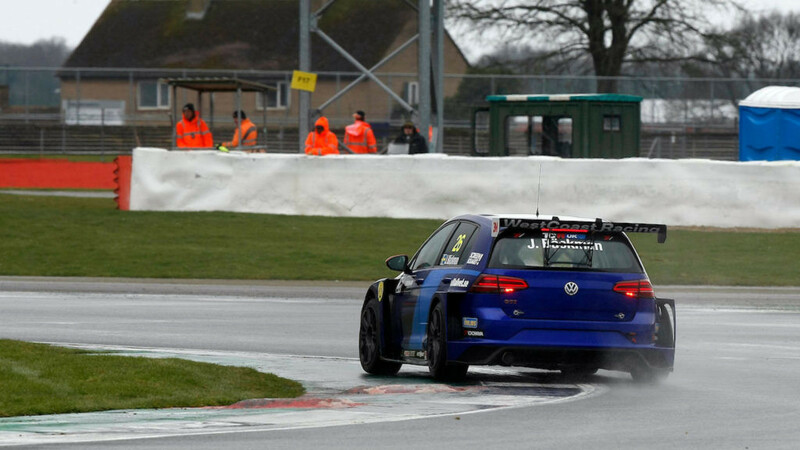 The two Swedish siblings Andreas and Jessica Bäckman had a strong weekend in the TCR UK championship at Silverstone, with Andreas scoring a second-place finish in the second race, and with Jessica’s best finish sixth in Race 2, working her way forward from tenth on the grid. The Bäckmans were driving with WestCoast Racing in the team’s 2017 TCR International Series Volkswagen Golf GTI TCRs, and scored strongly in both races, working their way forward from their grid positions. Andreas Bäckman was briefly credited with a podium result in Race 1 after a penalty was handed to Aiden Moffat, but the 22-year-old was demoted back to fourth when the penalty was rescinded, but fought back in the second race, fighting throughout the race with Moffat for second, coming out on top when Moffat ran out of fuel with two laps to go. “Both races were really good,” Andreas told TouringCarTimes. “I had good starts in both races, but in Race 2 during the first few laps I wasn’t fast enough and then Dan caught me. After that, when I was behind Moffat, I found I was much faster, but it was really hard to overtake, as he was really fast in the straights and I was faster in the corners. Jessica Bäckman had a competitive debut, with the 20-year-old battling Finnish driver Olli Kangas in Race 1, at one point finding herself in the middle of a six-car melee, while in Race 2 she picked her way forward, passing Darelle Wilson’s Vauxhall Astra and Stewart Lines in his Cupra TCR to secure sixth position in the WestCoast Volkswagen. “Everything was quite different, and I really enjoyed it, although it was quite difficult at one point when I was at the back and there were people everywhere,” she said. The Bäckmans programme for the remainder of 2018 is uncertain, with both TCR UK and the Scandinavian Touring Car Championship (STCC) currently options for the pair.